2 March 1963 - The Beatles' had their first number one single (their second release), Please, Please, Me. 6 April 1963 - In the afternoon, while shopping with her friend, Phyllis, in Penny Lane, Cynthia had her first signs of labor. Later that evening, Cynthia and Phyllis arrived at Sefton General Hospital via an ambulance in labor. 15 April 1963 - John sneaks into Sefton General Hospital wearing a disguise consisting of a hat, a fake moustache and dark glasses. He told Cynthia, "He's bloody marvelous, Cyn. Isn't he absolutely fantastic? Whose going to be a famous little rocker like dad?" 18 April 1963 - The Beatles' third single From Me To You was released and became their 2nd #1 hit. Hence, Julian and Beatlemania were born very closely together. Since many of the Beatles' fans were young girls, Cynthia and Julian were forced to keep a low profile... Brian Epstein, the Beatles' manager, thought that having a wife and child would hinder the "witty" Beatle's popularity. During this time Cynthia and Julian lived with John's Aunt Mimi. 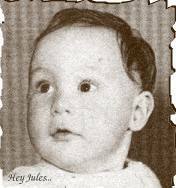 May 1963 - Sometime between the 12th and the 18th John and Cynthia register Julian. 3 August 1963 - The Beatles perform their final performance at The Cavern. 13 October 1963 - The Beatles appear on Sunday Night at the Palliduim. November 1963 - Cynthia and Julian move to Cynthia's place on Trinity Road in Hoylake. Cynthia takes Julian to Hoylake Parish Church to have Julian christened while John was off touring with the band. Upon leaving the church, photographers captured several shots of Cyn and Jules which were plastered over the next days papers, upsetting John and sufficiently breaking the news of his secret family. 4 November 1963 - The Beatles play the Royal Command Variety Performance at the Prince of Wales Theater... Julian later spoofs this performance in his 1999 I Don't Wanna Know video. 29 December 1963 - WMCA in New York City becomes the first radio station in America to play the Beatles' song I Wanna Hold Your Hand.